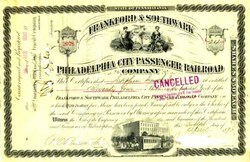 Beautifully engraved certificate from the Frankford & Southhawk Philadelphia City Passenger Railroad Company issued in 1893-1899. This historic document was printed by the American Banknote Company and has an ornate border around it with vignettes of a horse drawn street car being pulled through downtown and an allegorical woman, a soldier, and an angel sitting by the water. This item is hand signed by the company�s president and treasurer and is over 101 years old. This certificate has period cancellations and the president's signature has been clipped as shown in the scan. 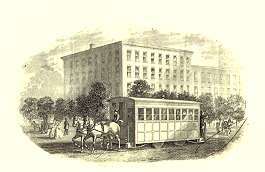 Horse drawn street car vignettes are highly desirable.